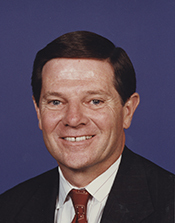 DeLAY, Thomas Dale, a Representative from Texas; born in Laredo, Webb County, Tex., April 8, 1947; graduated from Calallan High School, Corpus Christi, Tex., 1965; attended Baylor University, Waco, Tex., 1967; B.S., University of Houston, Houston, Tex., 1970; business owner; member of the Texas state house of representatives, 1979-1984; elected as a Republican to the Ninety-ninth and to the ten succeeding Congresses until his resignation on June 9, 2006 (January 3, 1985-June 9, 2006); majority whip (One Hundred Fourth Congress to One Hundred Seventh Congress); majority leader (One Hundred Eighth and One Hundred Ninth Congress). DeLay, Tom, with Stephen Mansfield. No Retreat, No Surrender: One Americans Fight. New York: Sentinel, 2007.